Located in the transition zone between the wetter Western Washington and drier Eastern Washington, Conboy Lake National Wildlife Refuge is one of the most biologically diverse areas in Washington. Its elevation and proximity to 12,276-foot Mt. Adams add to the diversity. The refuge was established in the mid-1960s to provide habitat for migrating spring waterfowl. Thousand of ducks and Canada Geese stop over on the way north, feeding on the lush green pasture and hay, and resting on the flooded lakebed. If the refuge were being established today, biodiversity would be the reason. The term ''lake''is a bit of a misnomer, as the area is actually a seasonal marsh. It occupies a portion of the historic Conboy and Camas Lake-bed, and is checker-boarded with adjacent private land. Native Americans used the area for summer residence and gathered food - camas in the spring, strawberries and huckleberries in the summer. The area was flooded seasonally, with some areas having permanent but shallow water. Early settlers constructed a drainage system in hopes of creating an agricultural area. Seasonal high water and a short growing season kept the area a subsistence-level ranch and farm enterprise. Logging was and still is an important industry. The refuge includes Ponderosa and lodgepole pine forests, stands of Douglas fir, and Oregon white oak. The forests are located in the old lake bottom as well as on surrounding ridges. Upland grasslands provide a transition between the forested ridges and include bunchgrass and introduced species. Shrubs and forbs are an important part of the habitat, with bitterbrush and spirea being the dominant species. Seasonally wet meadows occupy the elevation below the grassland, and acreage varies with the amount of rainfall and snow-melt each year. Introduced reed canary-grass is dominant, although native sedges and rushes are common in less disturbed sites. Water distribution is dictated by weather, but the refuge is developing water control capabilities to enhance wetland management (permanent vs. seasonal). Cattails, bulrush, and smartweed as well as other native species dominate. 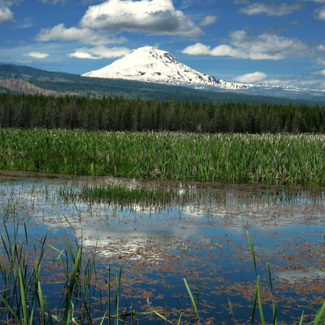 The water control has also benefited the Oregon spotted frog, and Conboy provides one of the best habitats for the frog in its entire former range. Camas and aquatic buttercup bloom in blue and yellow at certain locations every spring. (For a list of native plants, see References below.) Herds of elk are often visible on the refuge and adjacent private lands. Coyotes, bobcat, river otters, deer, and bear are residents (although not often seen). Work done by the refuge to control water levels and reduce human impacts has resulted in the return of Greater Sandhill Cranes to nest on the refuge and surrounding area. Historically, they nested in the state but were last reported in 1941. In 1979, a nest was found on the refuge and there are now over 20 nesting pairs. The location, depth, and timing of water distribution are important to other birds, as well. Migrating Mallards, Pintail, teal, and swans need deep water for rest, food, and safety. Receding water creates mud margins utilized by Killdeer, Spotted Sandpipers, and other shorebirds. Waders, like the Great Blue Heron, work the shallow waters for young fish and invertebrates. Irrigation stimulates new plant growth, or browse, for migrating Canada Geese. (taken from the Conboy National Wildlife Refuge General Leaflet, U.S. Fish and Wildlife Service, June, 2001) Nesting species include jays, woodpeckers, and Wood Ducks. A total of 165 species have been spotted on the refuge. Each season offers something unique. Spring is best for viewing the concentrations of waterfowl and wildflowers, and to see the lakebed full of water. Summer starts with a sea of grass, much of which is cut for hay by summer's end. Elk with calves are common and Sandhill Cranes can be seen in the meadows with their young. Fall brings spectacular color to the aspen and, with Mt. Adams for a backdrop, some terrific views. Winter can have deep snow, but the lakebed begins to fill as the snow melts and spring migration approaches. The refuge is accessible from the southwest or from the east. From the southwest, take Route 141 north from Route 14 to either BZ Corners, milepost 13, or milepost 21 (south of Trout Lake), where one can use the BZ/Glenwood Highway or the Warner Road/Trout Lake-Glenwood Highway to proceed to the Glenwood valley. Public access is during daylight hours only, 365 days a year. Public access is limited to the area around refuge headquarters, including the Willard Springs foot-trail. The trail runs through timbered land with views across the lakebed. County roads bisect and surround the refuge and provide excellent opportunities to view both wildlife and scenery. For more information about the refuge, please see our Resources Page. Lodging is available in Glenwood and Trout Lake. There are no poisonous snakes. Ticks and mosquitoes are common in the spring and summer, so be prepared.